SalesPoint™ Map from Rockledge Software enables your reps to sell more of your newspaper products such as Preprints, Print and Deliver, Post It Notes, TMC and more. With custom maps of your market, reps can quickly and easily prepare custom presentations and proposals with accurate circulation and distribution numbers for every customer. Do you sell preprints or inserts by truck route? Do you sell split zip codes in your market? Do you have unusual preprint or insert zones? Want to sell at the block group level? No problem! SalesPoint Map is designed to “think” in the units you sell. By designing our own maps instead of using a third party retailer, we can accommodate any selling style. By using a series of tools like insets, blow outs, and special out of market click boxes, SalesPoint Map supports your selling style. Selling with Demographic data is important to your advertisers. If you have access to demographic data, you can make them available to your reps through SalesPoint, increasing the power of your presentations and proposals. Integrating your demographic data not only enables your sales team to make smarter recommendations, it leverages a valuable resource that your newspaper already owns. SalesPoint™ Map is simple enough that every rep will be able to use it, but powerful enough that even your most demanding reps will find all the features they need. A simple wizard design allows you to build a complete proposal in four steps. Gorgeous maps – no matter how close in you get. Our new mapping technology redraws the maps as you zoom closer into your desired view, showing additional roads when you’re in close, but keeping the map clutter-free when you’re further back. 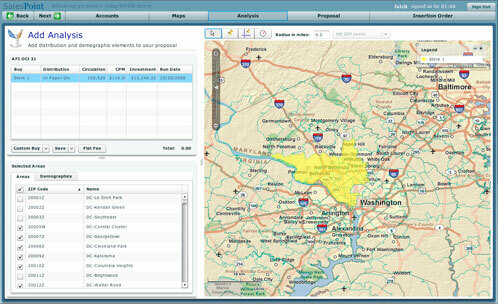 Because SalesPoint Map is web-enabled, you can access your proposals from any computer with a connection to the internet. And because your data is password-protected, it’s safe from prying eyes! 2. Create an Adobe™ Acrobat PDF copy of your proposal for easy emailing to your client. 3. Create JPEG images of your proposal for use with Microsoft™ PowerPoint. Then, when the proposal is approved, you can automatically create the insertion order. We understand that the proposal isn’t the last step in the selling process. Hopefully, it’s just the beginning. With SalesPoint Insertion Order, a simple click turns your proposal into an insertion order, with all the information from your map already filled out! Simply enter any remaining information, click to create your output, and you’re done! Want more? Orders can then be used as templates for future orders. Open a template, change a run date, and suddenly circulation values are updated. Add or subtract areas through an easy to use drag and drop interface. Routing tools let you address work flow issues like manager approval for late ads or credit checks. Still want more? Ok, how about we integrate the orders so they electronically transfer into your accounting or packaging system? This feature will change your world. Imagine no more key punch errors, no lost orders. For some of our clients this has even meant a change in deadlines, which transfers to more selling time and more sales! Track the heck out of it. If you do it in SalesPoint you can most likely track it. Track what areas are being sold the most, and the least. What product generates the most revenue? What day of the week is sold the most often? 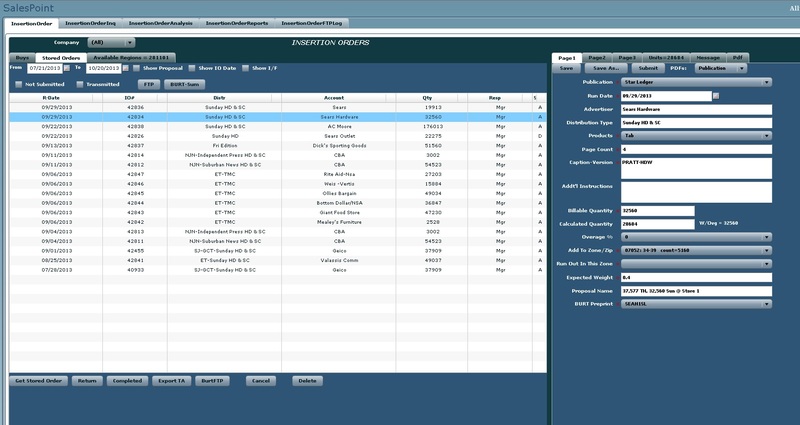 SalesPoint reports can be used to manage sales reps, analyze distribution areas, and even manage TMC mail costs.